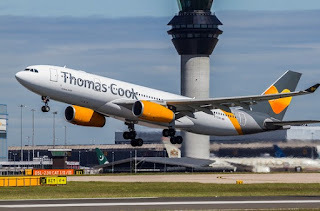 Leisure carrier Thomas Cook Airlines will begin new seasonal service from Seattle-Tacoma International Airport (SEA) to Manchester Airport (MAN) in the United Kingdom beginning May 27, 2018, marking the first non-stop flights connecting the two cities. Manchester is one of the UK’s most-visited cities, behind London and Edinburgh, Scotland. Debus was referring to the Condor service linking SEA to Frankfurt (FRA) and Munich, Germany (MUC), as previously reported by TheTravelPro. Both Condor and Thomas Cook Airline are part of the Thomas Cook Group. Local officials were equally effusive about the new service. Thomas Cook will operate non-stop flights twice weekly, on Thursdays and Sundays, using an Airbus A330 aircraft. According to SeatGuru.com, the carrier has A330s in two configurations. One has 273 standard economy and 49 premium economy seats while the other has 321 economy seats. Economy seats in both configurations are 18.2 inches wide with 31 inches of pitch, while the premium economy seats at 19.7 inches wide with 35 inches of pitch. While not among the most rapacious with the levying of so-called à la carte charges, because it is a leisure carrier passengers can anticipate a range of add-on charges, depending on the class of passage they purchase. Baggage limitations will also vary between economy and premium economy. For example, Economy Class passengers can check one bag weighing up to 23 kilograms, or about 51 pounds, while Premium Class passengers can check a bag weighing up to 32 kgs., or about 71 lbs. Limits on carry-on baggage, called “Cabin baggage” by the airline, vary as well. Economy passengers’ carry-on baggage is limited to 6 kgs,, or about 13.2 lbs, while Premium Class passengers are allowed 10 kgs. (22 lbs.). Economy class passengers can also anticipate paying separately for certain beverages, in-flight entertainment, and for selecting certain seats. The airlines also assesses a credit card fee of two percent of the ticket price, to a maximum of £95 per transaction. On a more positive note, Thomas Cook Airlines was named No. 6 of the World’s Best Leisure Airlines in the 2017 SKYTRAX World Airline Awards.